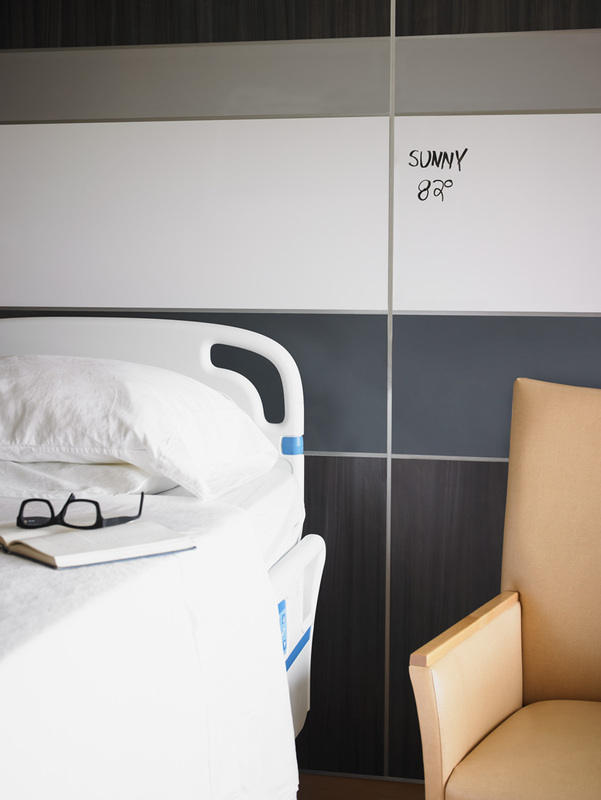 Laminates provide added durability and functionality in vertical applications, as seen in this stylish hospital room. Misconception 1: Laminates are often used on countertops and so there is a common misconception that these products are only used horizontally. Reality: Laminate can be specified vertically and performs very well in these applications. This includes walls and pony walls, back splashes, and even formed around columns. Misconception 2: Perhaps because HPL products are often colorful with attractive surfaces, there is a common misconception that harsher cleaners cannot be used on laminate, thus it’s not suitable for health care. Reality: Standard HPL is extremely durable and cleanable, and many of the specialty products a designer or specifier may encounter have surpassed industry standards for durability, cleanability, etc. The challenge: In health-care settings, walls, hallways, and stairways are subject to tremendous contact from people, beds, carts, and gurneys. Unlike a commercial setting such as an office or retail store where the walls are protected by filing cabinets or desks or clothing racks, the walls in a health-care setting are more likely to be exposed to traffic. This helps move patients and equipment quickly from place to place and also creates the ever-important ability to clean and sterilize the surfaces. In an outbreak of infectious disease, for instance, this ability is critical. At the same time, these surfaces that see so much traffic and house patients should embody the designer’s touch for color and style. Laminate panels strengthened with fiberglass give walls, hallways, and stairways the durability needed in highly trafficked areas. The specification: The ideal protection panels for walls and hallways should be extra durable with superior impact resistance. As such facilities are typically renovated every 10 or 20 years, the walls need to be durable enough to withstand years of impacts. Toward that trend, one manufacturer has introduced a new line of fiberglass-reinforced decorative protection panels. The advantage of such a product is that it is available in the manufacturer’s line of color and patterns to seamlessly blend with other types of surfaces in the specification. Such panels are impact and water resistant, easy to install and clean, dimensionally stable, and have a Class A fire rating. Panels such as these can be applied directly to drywall and are suitable for many vertical applications. 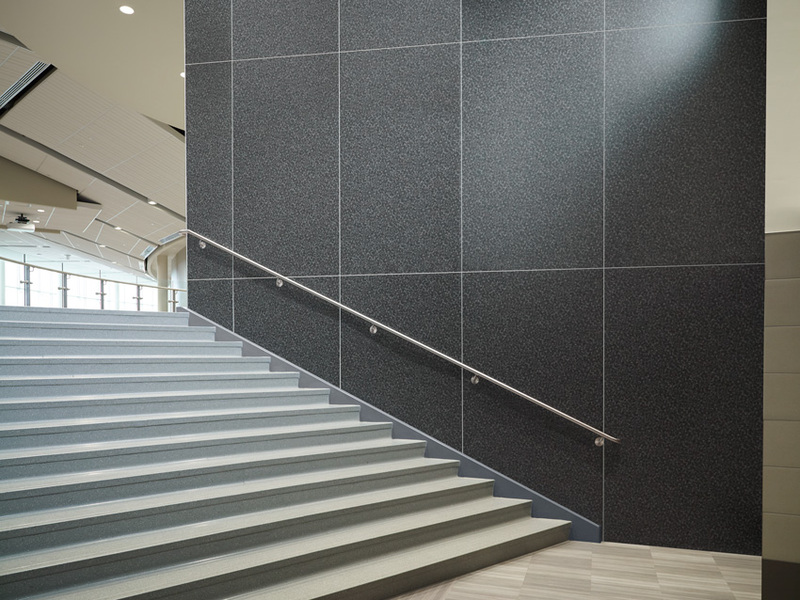 In addition to health-care settings, fiberglass-reinforced laminates can be specified for restaurants, schools and universities, airports, and elevators. The challenge: A health-care setting, unlike less-complex settings, includes patient rooms, examination rooms, cafeterias, and break rooms, as well as public restrooms and private patient restrooms. These areas call for durable and extremely cleanable surfaces that can be coordinated with the rest of the design aesthetic. 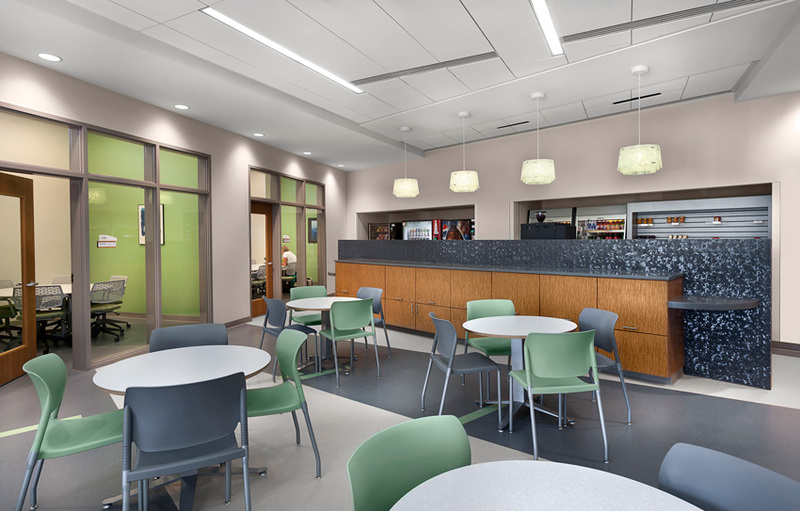 Solid surfacing is a suitable choice for the cafeteria in a health-care setting. When all products can be specified by one manufacturer who offers coordinating colors and patterns, there will be a seamless harmony between different types of products. The specification: For counters, food areas, and restrooms, solid surfacing is a good choice. Solid surfacing is a solid homogeneous material suitable for many functional and decorative applications. It is a fully densified composite of modified resin and mineral filler. Solid surfacing is an ideal specification for such health-care uses as counters, food environments, and restrooms. It shapes itself to virtually any design concept, and most manufacturers offer palettes of modern colors in every mood. The durable, nonporous surface is also ideal for a worktable or custom bar top as well as sinks and shower surrounds. It is generally available in sheet stock (1⁄4 inch or 1⁄2 inch) and formed into sinks and vanity bowls. The challenge: Long before any medical staff can diagnose or treat a disease or infection, the person carrying it will likely begin his or her health-care journey at the registration counter. Patient after patient will be using and touching the counter hour after hour. To protect other patients, their families, and the staff, the registration counter will need to be kept clean and sterile. But being at the registration counter should also be a pleasing experience to get the health-care process off to a calming and harmonious start. The ideal reception counter will be cleanable, resist fingerprints, and have antimicrobial qualities. 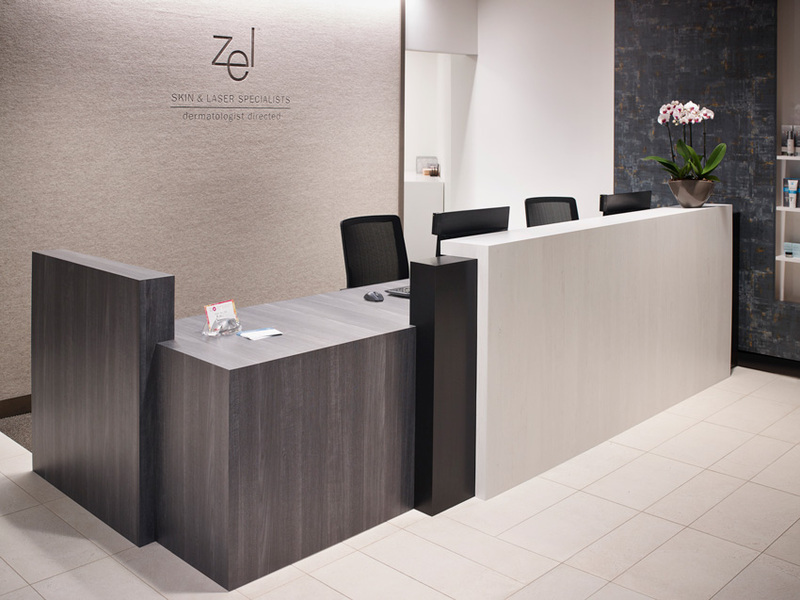 The specification: As the first surface a patient interacts with, the ideal material for a registration counter should be both beautiful and durable, perhaps with a soft-to-the-touch super matte finish that resists fingerprints. The most ideal product would have built-in antimicrobial surface protection, a technology that stops the growth of mildew and mold, which can cause stains and odors. In addition to health-care settings, this type of surfacing is also suitable for high-traffic areas such as cafes, diners and quick-service restaurants, hotels and retail, commercial offices, or any setting that calls for countertops, tables, doors, partitions, cabinets, and furniture. The challenge: Of all the surfaces in a health-care setting, the lab and operating rooms are subject to the most chemicals and other liquid and solid materials. Consider the typical laboratory chemicals and reagents that were used to test a leading manufacturer’s most chemical-resistant laminate sheets. They include acetic acid, formaldehyde, hydrogen peroxide, sulfuric acid, zinc oxide, and more. To achieve certification from the Scientific Equipment and Furniture Association for use in labs, products are tested for exposure to 49 harsh chemicals. 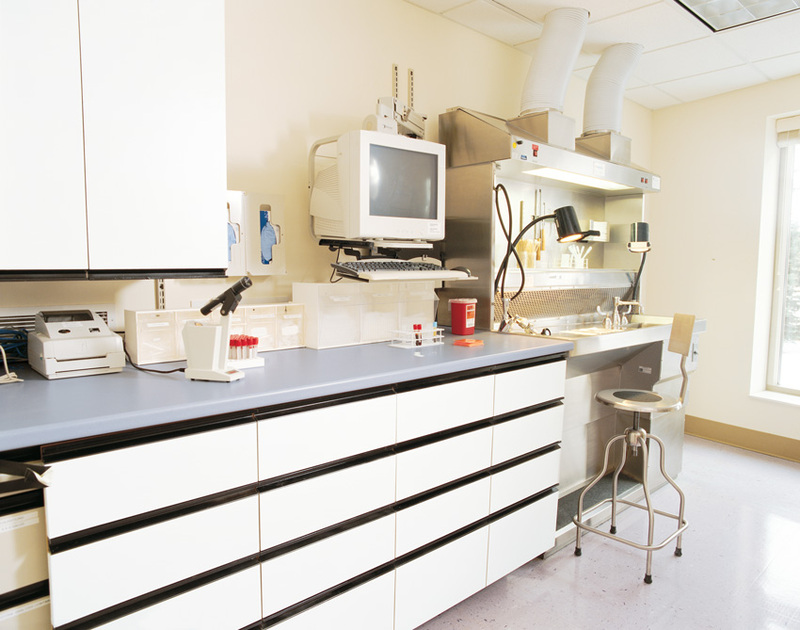 Laboratory and operating room surfaces are subject to a multitude of harsh chemicals. Rigorous testing ensures these surfaces can hold up to such chemicals without damage. The specification: For such a challenging environment where surfaces are exposed to chemicals, abrasive materials, and other surface stresses, a chemically resistant laminate is absolutely critical. This product typically is available in laminate sheets intended for application to interior horizontal and vertical surfaces where design, appearance, quality, durability, and resistance to relatively harsh acids, alkalis, corrosive salts, and other destructive or staining substances are required. Horizontal surfaces include sinks, counters, lab benches, tabletops, and other work surfaces in chemical, medical, and scientific settings, pathogenic laboratories, clinics, photographic laboratories, mortuaries, nursing stations, and other institutional uses, as well as commercial or light-duty manufacturing operations. Vertical surfaces where a chemically resistant surface is advised include cabinets, casework fronts, wall backsplash panels, and screens. Also recommended are laminate sheets that are available in a postformable grade and can be postformed around an outside radius and an inside cove radius. Postforming provides an ergonomic edge and protection against chemicals attacking a fabricated seam.